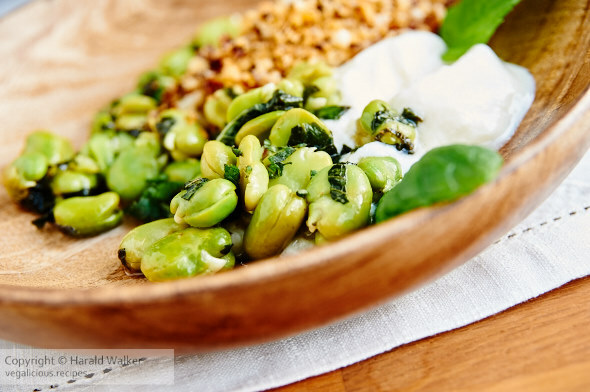 We enjoyed this tasty Moroccan style broad bean (fava beans) salad with soy yogurt and crunchy bits tonight. It’s a delicious and a very flavorful salad recipe from Jamie Oliver. Fresh board beans (fava beans) are nice, but if you can get frozen ones then it’s not so much work to prepare. Of course we used soy yogurt to make it, but otherwise it is a vegan recipe. Posted by Chris Walker on March 15, 2010 in Beans, Reviews, Soy yogurt.